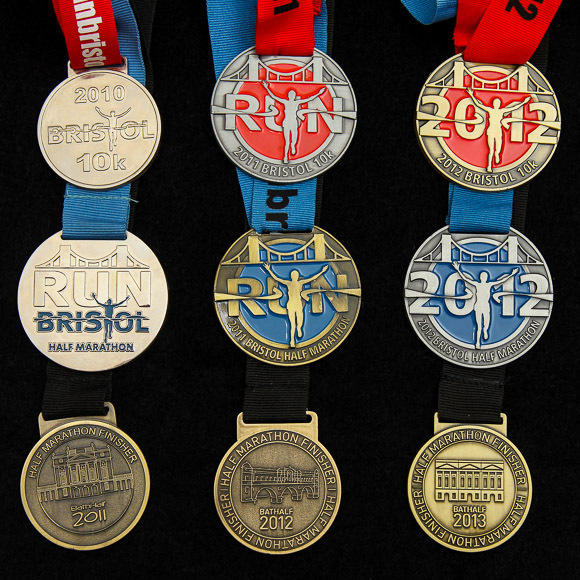 I wasn’t as worried about the Bath Half this year as I was last year. Last year I hadn’t done enough distance training. This year I managed a 15K including some fairly steep hills a week and a bit before the Half, so I reckoned I was ready. I also woke up yesterday morning having slept fairly well and without the kind of headache which annoyed me during the last Bristol Half. Driving to Bath Racecourse to enjoy their usual Half Marathon Park & Ride scheme, the weather was a bit of a concern, though. There was a lot more frost about than I’d seen on previous years, and my car’s temperature sensor said it was -0.5C outside. On the other hand, I’d rather be too cold than too hot, and it was the heat that really got to me — and quite a few other people — last year. A cup of tea at the race course, a quick coach ride into town, a loo stop and an idle wander around the runner’s village, and it was time to form up into our start lines. It was still so cold that I was almost tempted to keep on the £2 charity‐shop fleece I’d picked up on Saturday, but I realised I’d soon warm up, so I dumped it at the side to be collected for recycling as the queue started moving. 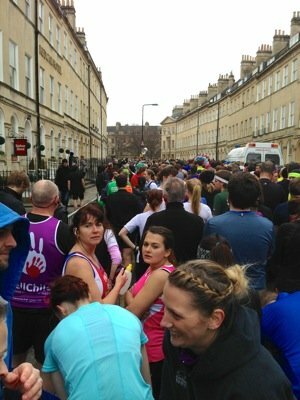 Apparently there were 11,156 of us, and I could easily believe it for the first few kilometres through the centre of Bath. This was a bit problematic for some, as it made obstacles a lot less obvious. One poor bloke, distracted by cheering supporters at the top of a double‐decker bus, tripped right over one of the traffic cones separating the two lanes of the race, which was barely visible in the forest of pumping legs. Still, he picked himself up and carried on quickly enough. I managed to survive unscathed, and started thinking a bit about the kind of mental trickery I talked about in my last post. What could I do to make the race psychologically easier? 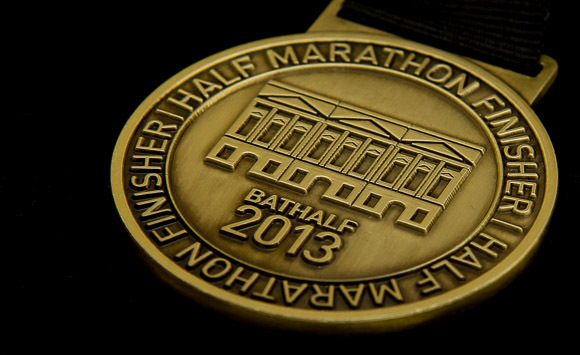 The problem I had with the Bath Half last time was that it’s a two‐lap race. You do more than 10K, and then you do it all again. I decided, therefore, to treat the first lap as a warmup. The first lap wasn’t part of the race at all, in my mind. The first lap was just a jog to the starting line. The real race would be the second lap. As it turned out, this mental trickery worked well for me. The first lap passed fairly quickly — I may write a separate blog post about what goes through runner’s minds when they’re on long runs — and was no problem at all. The halfway point came up sooner than I was expecting, in fact. Around there, I spotted my friend Mandy cheering people on, too, which was a bonus. And thus began the second lap. I decided to break it up into two 5K runs in my head, with a break about halfway through where I could eat the gel energy thingy I was carrying. I carried on, passing again the excellent live rock band who had been doing a suitably‐raunchy version of Sweet Home Alabama on the first lap, enjoying the support, passing some lovely fancy dressers, which included overtaking a Smurf, and generally enjoying myself. After 5K more, I decided to take a quick loo break, as I’d been wanting to go for a while, and I spotted a free cubicle by one of the water stations. On my way back to the road, I took the chance to check my time and do a few mental calculations, and was pleasantly surprised. All I had to do was jog 5K at about my normal pace, and I’d be coming in under 2 hours 45, which is comfortably under my personal best. Of course, it’s never that easy, and though I forced down my energy gel, it didn’t seem to give me that much energy, and the last few kilometres were quite a struggle. I kept on going, though, increasingly relying more on bloodymindedness than physical strength. I passed my cheering friends José and Emma, which was a nice boost, and soon after that passed Mandy for the second time, and knew I was nearly done. And at least there wasn’t much danger of overheating, as it was still bloody freezing! It was quite tough coming up to the finish line. There was one very happy reason for that, which was that even if I’d stopped jogging and walked there, I’d still have beaten my personal best. But I resisted the temptation and jogged all the way. In the end, I managed to get around in 02:42:05, a whole five minutes faster than my previous best time. Hurrah!